Workman Publishing Company, 9780761160953, 544pp. It’s the revolutionary science study guide just for middle school students from the brains behind Brain Quest. Everything You Need to Ace Science . . . takes readers from scientific investigation and the engineering design process to the Periodic Table; forces and motion; forms of energy; outer space and the solar system; to earth sciences, biology, body systems, ecology, and more. The BIG FAT NOTEBOOK™ series is built on a simple and irresistible conceit—borrowing the notes from the smartest kid in class. There are five books in all, and each is the only book you need for each main subject taught in middle school: Math, Science, American History, English Language Arts, and World History. Inside the reader will find every subject’s key concepts, easily digested and summarized: Critical ideas highlighted in neon colors. Definitions explained. Doodles that illuminate tricky concepts in marker. Mnemonics for memorable shortcuts. And quizzes to recap it all. 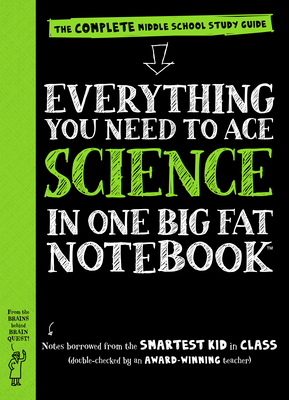 The BIG FAT NOTEBOOKS meet Common Core State Standards, Next Generation Science Standards, and state history standards, and are vetted by National and State Teacher of the Year Award–winning teachers. They make learning fun, and are the perfect next step for every kid who grew up on Brain Quest. Sharon Madanes was Pre-Med at Yale University, received an MFA at Hunter College, and is currently in medical school at Columbia University Vagelos College of Physicians and Surgeons. At Yale she taught a health curriculum to New Haven public school students and was awarded the Seymour Lustman Prize to make a documentary about a geological disaster in Indonesia. Sharon regularly exhibits her artwork and is a current resident at the Drawing Center in Manhattan, where she focuses on medical culture and aesthetics.